Uh, oh, Red Riding Hood has a problem – she can’t find Little Boy Blue. There’s only one solution: gather your group of friends to your secret club, transform into Super Readers, hop into your WhyFlyers (they probably use a lot of fuel), jump into a storybook, chase down the clues, solve numerous riddles, collect Super Letters, interact with storybook characters who very 2-dimensional (so shallow), and finally, 30 minutes later realize you just needed to be “clever”. Or, there’s Option B: get Wifi. Don’t know where LBB went? Bet he checked in with Foursquare somewhere. Not sure why he left? Well, look at that, he just tweeted that he’s headed out for brunch. Yup, just posted a picture of his French Toast on Instagram (no filter). Dear me, what is that mice like to eat? Just ask Google, Prince Charming. 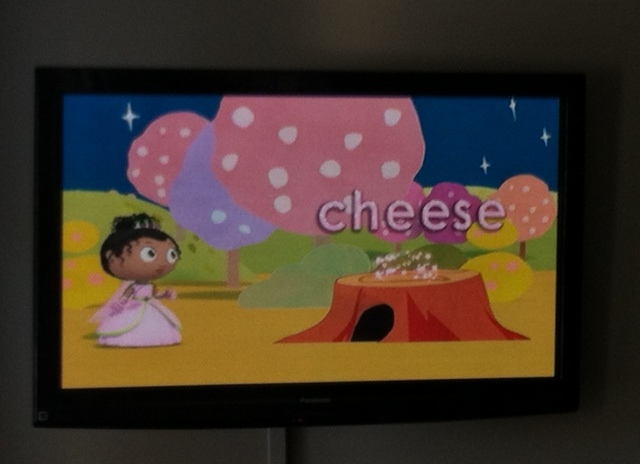 Oh, Princess Pea didn’t know how to spell “cheese”? The Oxford dictionary is now online. Unsure what Super Duper means? Urban Dictionary, guys. Next Season: SuperReaders to the Rescue! Solving your problems in 2 minutes or less thanks to unlimited data plans. I cannot stand that show. I meant to dedicate this post to you, Ricky. Bryan and I just spent three days without WiFi. It was fun, but weird. Previous Previous post: Et tu, Brute?